Technology has evolved out to revolutionize our lives in recent few years. New gadgets like smartphone, smart watches, smart bracelets etc. have completely changed the way we used to think, live, connect, communicate, enjoy and play. The introduction of the latest gadgets like smart bracelets has taken our digital life a step further as it helps us track and monitor health and fitness effectively. The usage of smart technology in health monitoring and fitness tracking is increasingly getting popular these days. And one of the core reason for this is that smart gadgets are monitoring the health and tracking fitness very effectively. There is a craze for buying new smart bracelets and fitness tracker bands. Although there are very few smart bracelets available in the market, but today we are covering one of the best smart bracelet available for buying – Xiaomi MiBand Bluetooth Smart Bracelet. Where to Buy Xiaomi Miband Bluetooth Smart Bracelet Watch ? Buy Xiaomi Miband Before the Stock Lasts. Xiaomi MiBand is made up of an aluminum alloy sensor and hypoallergenic band. Oval shaped 14 x 36 x 9mm measures MiBand Sensor looks like a capsule. According to MI the 1mm thick aluminum alloy sensor is manufactured using a 12-step process. Every single point of light-weight body of 5.0g capsule sensor designs with premium quality of technology. The MiBand doesn’t have any screen on its front panel, the only thing that is noticeable is its three LED lights. All the three LED indicator lights are 1mm in diameter and is powered by micro-laser perforation technology. Developers injected each indicator with UV adhesives to prevent penetrating the device from dust. The indicators are designed to indicate you about your progress, phone calls and alarms. 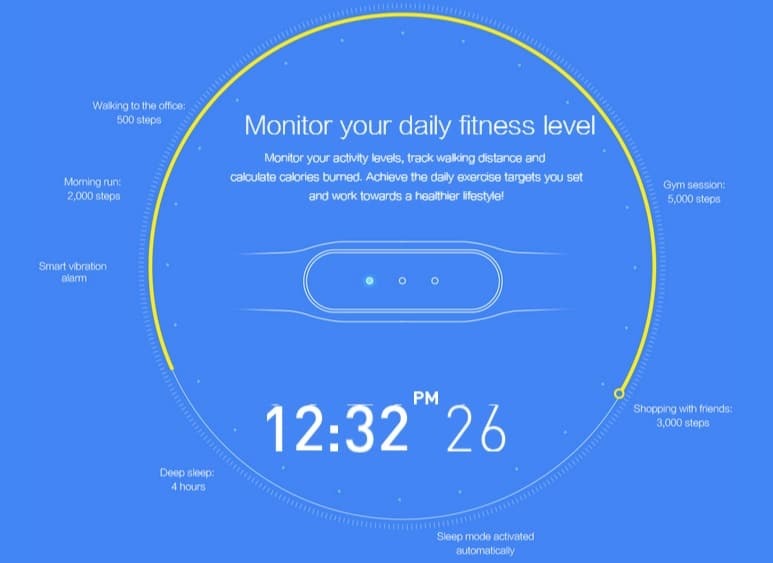 Xiaomi used everything that is necessary for creating Miband a good fitness band. Like military-grade sensor premium quality Bluetooth are used to monitor your every single move. Its ultra-thin 8mm battery is quite good at maintaining the thickness of the band. After polishing, sandblasting and compression molding the Miband metal sensor is ready with smooth surface. CNC milling process adds shine to its edges. 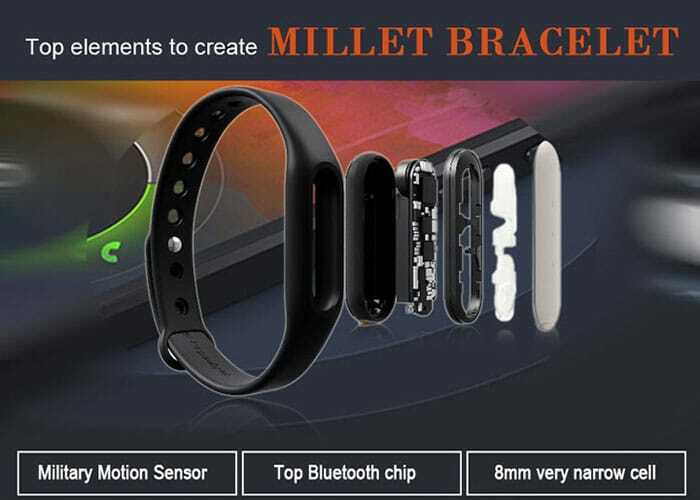 The metal sensor is connected with hypoallergenic band which adjustable between 157mm and 250mm. Its Dow Corning TPSiV material provides softness and great wearing comfort. The band is suitable for sensitive skin, even there is no any irritation while wearing it for a long time. Xiaomi Miband records and monitors your every action. It helps you track your walking, running distance and get notified about your covered distance. The first necessary thing for using Miband is you have to install My Fit app on your android or iOS device. My Fit connects with your phone via Bluetooth and synchronize your records from Miband to your phone. Login to Mi Fit app with MI account details, on first login you will be asked to enter your birth date, gender, height and weight. Now you can set your daily steps goal. Miband notifies you about your achievement of your target with LED lights integrated in it. Mi Fit provides you the stats of your daily steps, walking distance and calories burnt by you. The band also monitors your sleeping and waking up time. You can also get the stats of your sleeping hours from the app. Miband alarmed you after monitoring your rising and sleeping time. You can set incoming calls, notification and alarms with vibration. You can also choose your favorite colors for LED lights. Apart from this, the best thing about Miband is you don’t have to enter your passcode every time when you try to unlock your phone. You can identify yourself just by Miband but you should maintain the distance of 1.5m between your phone and bracelet. The Miband is certified IP67 water-resistant. It has Lithium-ion Polymer battery with capacity of 41mAh that last 30 days on one full charge. That is 4 times longer than the other fitness band. Miband is also available in different colors. For the Limited Time Period, Xiaomi Miband Bluetooth 4.0 Smart Bracelet Watch is Available for Sale on Online Shopping Portal Gear Best at Price of $15.99. 6 Reasons Why You Must Buy Tech Wearable Devices like Smart Watches ?